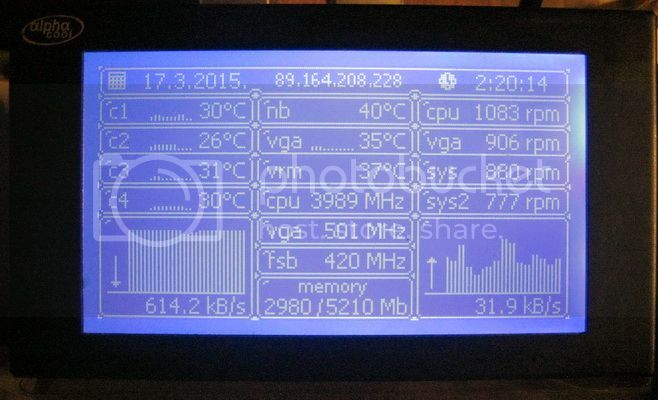 Thank you for supporting the AlphaCool LCD natively in AIDA64. It works great! One question, though. In the old AlphaLCD software, there was an option to blank the screen and turn off the LCD backlight when Windows shuts down. Is there anything similar in AIDA64? As it stands right now, AIDA64 leaves the display turned on when I shut down my computer. Thanks. AIDA64 is supposed to turn all LCDs off when it exits. 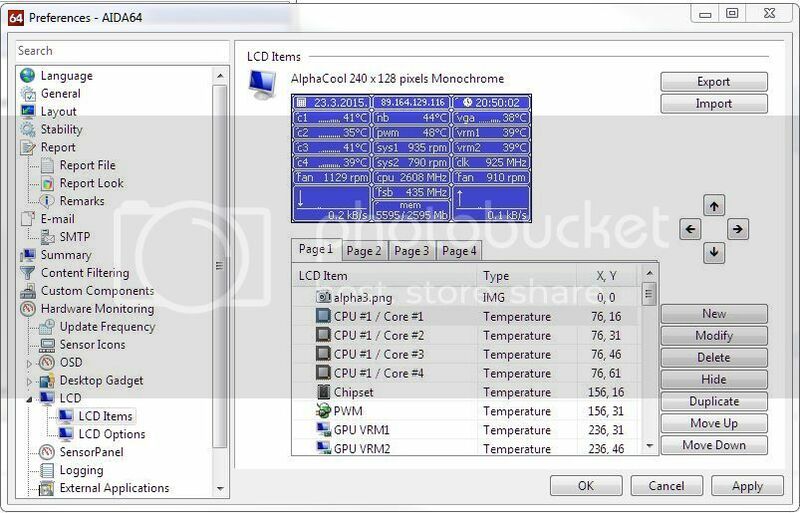 Not all LCDs support that feature, but AlphaCool does. What happens on your computer when you close AIDA64? If I exit AIDA64 while Windows is still running, it blanks the LCD and turns off the backlight, as desired. But if I shut down Windows without manually exiting AIDA64 first, then the LCD gets left on. It sounds a bit odd. Are you shutting down Windows, or putting the computer to sleep or standby or hibernation? And what motherboard and Windows do you use? We'll try to reproduce the issue on a similar test system if possible. Normal Windows shut down. I am running Windows 7 Pro on an ASUS Sabertooth Z97 Mark 2 motherboard with an Intel Core i7-4790K CPU. old thread but may as well ask here , the built in support for the alphacool does it use it,s own usb driver? the SDC Megatron works fine with all the software installed all i do is disable it, the alpha though it does not start i.e init failed, but the software/driver is installed, the odd thing now though if i try the second alpha screen that works never did before, got asked to test this a while ago just did not have the time, must be a conflict somewhere. got to say love this built in support it has been a while as well lol. AlphaCool LCD support requires the AlphaCool LibUSB drivers to be installed. Just install the AlphaCool software bundle, and it should install the driver too. thanks .. i have the Usb driver separate as well think its a later one that is in the package. Thanks for the Great performance that your team delivers here . Will it even be possible to operate the display vertically so that I could block the display standing ? I'm afraid we currently have no plans to support portrait mode for landscape external LCD screens. spaljeni can u send me your file please? the aida64 editor is not so comfortable as the alphacool editor itself. You can draw up anything you like on a 240 x 128 picture (I used Adobe Fireworks to do that) and then just put the values and text into place. It takes a bit of time and fiddling around with the Aida64 editor but it is worth it in the end. You can Save the image if you want to use it. First thing you need to do in the editor is choose "Image" and browse for where you saved this picture. Then you can add values and text and put them into place using the arrows in the editor. The rest is just Static Labels and Simple Sensor Items. Note that the 2 most popular AIDA64 visual monitoring modules, SensorPanel and LCD both use the same layout building solution and the same rendering engine. So whatever you read or watch about SensorPanel, will also apply to the LCD module. I would like to thank very much to everyone that made this here possible, the devs and the users. Your efforts made a part of my pc that was just there and did nothing for years to become alive again and show all the things that I like. P.S. Did I mention it, that I am very very glad that it works from within the AIDA? No need to use AlphaCool's SW anymore... YAY! Np, imop you all need and others need a bigger thank you for making Alphalcd useful again have you noticed the screens are for sale again you can even get the external surround i always thought they stopped doing them years ago.